1Division of Applied Bioresources Chemistry, The United Graduate School of Agricultural Sciences, Tottori University, Tottori, Japan; 2Department of Veterinary Science, Graduate School of Life and Environmental Sciences, Osaka Prefecture University, Osaka, Japan; 3MAC Gifu Research Institute, MicroAlgae Corporation, Gifu, Japan. Copyright © 2014 Fei Teng et al. This is an open access article distributed under the Creative Commons Attribution License, which permits unrestricted use, distribution, and reproduction in any medium, provided the original work is properly cited. In accordance of the Creative Commons Attribution License all Copyrights © 2014 are reserved for SCIRP and the owner of the intellectual property Fei Teng et al. All Copyright © 2014 are guarded by law and by SCIRP as a guardian. Vitamin B12 contents in the edible cyanobacterium Nostoc flagelliforme, also known as hair vegetable, were assayed using a microbiological method. We detected high vitamin B12 contents in samples of naturally grown cells (109.2 ± 18.5 μg/100g dry weight) and cultured cells (120.2 ± 53.6 μg/100g dry weight). However, commercially available hair vegetable samples, which comprised fake substitutes and Nostoc, had variable contents (4.8 - 101.6 μg/100g dry weight) because concomitant fake items contain very low vitamin B12 contents. To evaluate whether natural and cultured N. flagelliforme samples contained vitamin B12 or pseudovitamin B12, corrinoid compounds were purified and identified as pseudovitamin B12 (approximately 72%) and vitamin B12 (approximately 28%) using silica gel 60 TLC bioautography and LC/MS. The results suggested that N. flagelliforme contains substantial amounts of pseudovitamin B12, which is inactive in humans. Nostoc flagelliforme is an edible cyanobacterium, which grows naturally in some semidesert regions of China and Mongolia. When dried, the cyanobacterium resembles black hair and hence the name hair vegetable (“Facai” in Chinese), which is one of the most expensive ingredients in Chinese cuisine . At present, fake items and mixtures of pure N. flagelliforme with fake substitutes (approximately 90%) are flooding the market . Figure 1. Structures of vitamin B12 (B12) and pseudovitamin B12 (pseudo B12). (a) B12; (b) pseudo B12. which is inactive in humans, is the predominant corrinoid in the edible cyanobacteria used as a health food by humans. N. flagelliforme, hair vegetable, is already used as health food, but there is no information on about B12 contents in pure N. flagelliforme and commercially available hair vegetable, or whether the corrinoids are authentic B12 or inactive corrinoids. In the present study, we characterized corrinoid compounds from N. flagelliforme sources, including naturally grown samples, cultured samples, and commercially available hair vegetable samples. Authentic B12 was obtained from Sigma (St Louis, Missouri, USA). Silica gel 60 thin-layer chromatography (TLC) aluminum sheets were obtained from Merck (Darmstadt, Germany). All other reagents were highgrade commercially available reagents. N. flagelliforme Born. et Flah. was harvested from Alxa, Inner Mongolia, China, during the summer of 1996. After washing in water, the cyanobacterium was dried in sun and used for the analyses. It was also aseptically cultured in a Nostoc-N liquid medium (K2HPO4, 40 mg/L; MgSO4∙7H2O, 70 mg/L; Na2SiO3∙7H2O 60 mg/L; CaCl2∙2H2O 36 mg/L; FeSO4∙7H2O, 4.8 mg/L, EDTA 2Na, 1 mg/L; H3BO3, 2.86 mg/L; MnCl2∙4H2O, 1.8 mg/L; ZnSO4∙7H2O, 222 μg/L; Na2MoO4∙2H2O, 390 μg/L; CuSO4∙5H2O, 80 μg/L; and Co(NO3)2∙6H2O, 50 μg/L; at pH 7.5) at 20 - 25˚C with aeration under illumination (40 μmol/m2/s). Commercially available hair vegetable samples were purchased from the markets in Japan. Samples A-E were naturally grown samples, F-J were cultured samples, and K-N were commercially hair vegetable samples. Dried N. flagelliforme samples (five different lots of naturally grown and cultured samples and four commercially available hair vegetable samples) were used for the assays. First, 0.5 g of each sample was suspended in 40 mL of distilled water and homogenized with an ultrasonic disruptor UD-200 (Tomy, Tokyo, Japan). Total corrinoids were extracted after boiling at pH 4.8 in the presence of 4.0 × 10−4% KCN and determined using the Lactobacillus delbrueckii ATCC 7830 microbiological assay method, according to the method described in the Standard Tables of Food Composition in Japan. L. delbrueckii ATCC 7830 can utilize deoxyribosides, deoxyribonucleotides (known as alkali resistant factor), and B12. Thus, accurate B12 contents were calculated by subtracting the results for alkali resistant factor from those of total B12 . Bioautography of corrinoid compounds was performed as previously described . B12 extracts (20 mL) prepared as mentioned above were partially purified and concentrated using a Sep-Pak Plus® C18 cartridge (Waters Corp., Milfora, USA), which was washed with 5 mL of 75% (v/v) ethanol and equilibrated with 5 mL of distilled water. The C18 cartridge was washed with 5 mL of distilled water, and B12 compounds were eluted using 2 mL of 75% (v/v) ethanol. The eluate was evaporated in a centrifugal concentrator (Integrated SpeedVac® System ISS110; Savant Instruments Inv., NY, USA). The residual fraction was dissolved in 5.0 mL of distilled water. Concentrated B12 extracts (1 μL) and authentic and pseudo B12 (each 50 μg/L) were spotted onto the silica gel 60 TLC sheet and developed in the dark using 2-propanol/ NH4OH (28%)/water (7:1:2 v/v) at room temperature (25˚C). After drying the TLC sheet, it was overlaid with agar containing basal medium and precultured E. coli 215, and incubated at 37˚C for 20 h. The gel plate was then sprayed with methanol solution containing 2,3,5- triphenyltetrazolium salt, and B12 compounds were visualized as red, indicating E. coli growth. Each extract (40 mL) was partially purified and concentrated using a Sep-Pak® Plus C18 cartridge (Waters Corp) as described above. The eluate was evaporated in a centrifugal concentrator (Integrated Speed VacR System ISS110), and the residual fraction was dissolved in 5.0 mL of distilled water. The purified extract was loaded onto an immunoaffinity column [EASI-EXTRACT® Vitamin B12 Immunoaffinity Column (P80) R-Biopharm AG, Darmstadt, Germany], and the corrinoids were purified according to the manufacturer’s recommended protocol. Nostoc corrinoids, authentic pseudo B12, and B12 were dissolved in 0.1% (v/v) acetic acid and filtered using a Nanosep MF centrifuge device (0.4 μm, Pall Corp., Tokyo, JAPAN) to separate small particles. We analyzed an aliquot (2 μL) of the filtrate using a LCMS-IT-TOF coupled with an Ultra-Fast LC system (Shimadzu, Kyoto, JAPAN). Each purified corrinoid was injected into an Inert Sustain column (3 μm, 2.0 × 100 mm, GL Science, Tokyo, JAPAN) and equilibrated with 85% solvent A [0.1% (v/v) acetic acid)] and 15% solvent B (100% methanol) at 40˚C. Corrinoid compounds were eluted using a linear gradient of methanol (15% solvent B for 0 - 5 min, increasing the concentration from 15% to 90% solvent B for 5 - 11 min, and decreasing the concentration from 90% to 15% solvent B for 11 - 15 min). The flow rate was 0.2 mL/min. ESI conditions were determined by injecting authentic pseudo B12 or B12 into the MS detector to determine the optimum parameters for detecting the parent B12 compound and daughter ions. ESI-MS was operated in the positive ion mode. Argon was used as the collision gas. Pseudo B12 (m/z 672.777) and B12 (m/z 678.292) as [M+2H]2+ were confirmed by comparing the observed molecular ions and the retention times. Each immunoaffinity-purified B12 fraction (10 μL) was analyzed with a reversed-phase HPLC column (WakosilII 5C18RS, 4.6 × 150 mm; 5 μm particle size; Wako Pure Chemical Industries, Osaka, Japan). Corrinoids were isocratically eluted with 20% (v/v) methanol solution containing 1% (v/v) acetic acid at 40˚C and monitored by measuring the absorbance at 361 nm. The flow rate was 1 mL/min. Retention times of authentic B12 and pseudo B12 were 8.6 min and 10.7 min, respectively. The relative content ratio of B12 and pseudo B12 in various N. flagelliforme samples was calculated on the basis of peak areas with identical retention times of B12 and pseudo B12. Because fake materials generally contain starch , commercially available hair vegetable samples were tested using the iodine-starch reaction. The dried samples (0.1 g) were added to 10 mL of distilled water and boiled for 30 min. The treated samples were cooled to a room temperature and centrifuged at 10,000 × g for 10 min at 25˚C. Each supernatant solution (0.2 mL) was added to 1.4 mL of distilled water and treated with 0.4 mL of 25% Lugol solution (MP Biomedicals, LLC, Ohio, USA). The solution was allowed to stand for 30 min, and absorbance was measured at 600 nm. Microscopic analysis was performed using a BH-2 type microscope (Olympus Corp., Tokyo, Japan) with a digital camera QV-200 (Casio Computer Co. Ltd, Tokyo, Japan), as previously described . B12 contents were analyzed in various sources of N. flagelliforme i.e., naturally grown samples, cultured samples, and commercially available hair vegetable samples, using the L. delbrueckii ATCC 7830 microbiological assay method (Table 1). High B12 contents were detected in naturally grown cells (109.2 ± 18.5 μg/100g dry weight) and cultured cells (120.2 ± 53.6 μg/100g dry weight). 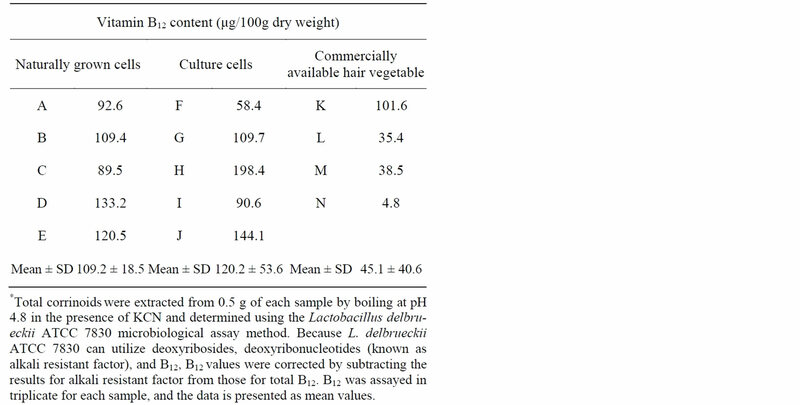 However, commercially available hair vegetable samples had very variable and lower B12 contents [45.1 ± 40.6 (range, 4.8 - 101.6) μg/100g dry weight]. B12 contents of natural and cultured cells were similar to those of other edible cyanobacteria, i.e., Spirulina sp. (127.2 - 244.3 μg/100g dry weight) , Suizenji-nori (Aphanothece sacrum, 143.8 μg/100g dry weight) , and Ishikurage (Nostoc commune, 98.8 μg/100g dry weight) . Corrinoids found in all Nostoc samples were analyzed using the E. coli 215 bioautogram after separation by silica gel 60 TLC (Figure 2). Corrinoids found in all Nostoc samples and the commercially available hair vegetable sample K were separated to yield two spots, the Rf values of which were identical to those of authentic pseudo B12 and B12, respectively. No or faint spots were obtained with commercially available hair vegetable samples L-N because of their lower B12 contents. Table 1. Vitamin B12 contents of various sources of Nostoc flagelliforme (naturally grown and cultured samples and commercially available hair vegetable samples). Figure 2. Escherichia coli 215 bioautogram analysis of corrinoids found in various Nostoc flagelliforme samples. (a) 1, authentic B12; 2, authentic pseudo B12; A-E, naturally grown samples; (b) 1, authentic B12; 2, authentic pseudo B12; F-J, cultured samples; (c) 1, authentic B12; 2, authentic pseudo B12; K-N, commercially available hair vegetable samples. One microliter of concentrated cell extracts and authentic B12 and pseudo B12 (each 50 μg/L), were spotted onto a silica gel 60 TLC sheet and developed in the dark using 2-propanol/NH4OH (28%)/water (7:1:2 v/v) at 25˚C. After drying the TLC sheet, it was overlaid with agar medium containing pre-cultured E. coli 215 and incubated at 37°C for 20 h. B12 compounds on the gel were visualized as red spots using 2,3,5-triphenyltetrazolium salt. The data are representative of typical bioautograms from three independent experiments. peaks with retention times of 7.55 and 7.42 min, respectively. Mass spectrum of authentic B12 indicated that a doubly-charged ion with an m/z of 678.2897 [M+2H]2+ was prominent (Figures 3(a) and (b)). The exact mass calculated from its formula (C63H88CoN14O14P) was 1354.5674, and the isotope distribution data showed that B12 was the major divalent ion under the LC/ESI-MS conditions. For authentic pseudo B12 with an exact mass of 1343.5375 (C59H83CoN17O14P), a doubly-charged ion with an m/z of 672.77861 [M+2H]2+ was prominent (Figures 3(d) and (e)). The MS/MS spectra of B12 and pseudo B12 indicated that the dominant ions at m/z 359.0982 and m/z 348.0684, respectively, were attributable to the nucleotide moiety of each corrinoid compound (Figures 3(c) and (f)). Nostoc corrinoids purified from the naturally grown sample E were eluted to yield several total ion peaks, indicating the presence of impurities (Figure 4(a)). Ion peaks at m/z 672.77 and m/z 678.29 for pseudo B12 and B12, respectively, were also detected, and their retention times were identical to those of authentic pseudo B12 and B12. The mass spectra at the retention times of 7.42 and 7.55 min showed that both pseudo B12 and B12 divalent ions were formed at m/z 672.7735 (Figure 4(b)) and m/z 678.2888 (Figure 4(d)), respectively. 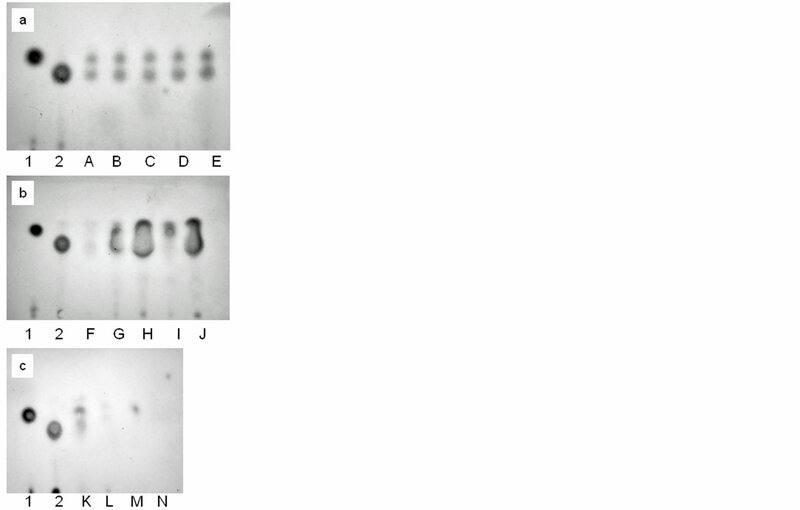 There spective MS/MS spectra of each compound were identical to those of authentic pseudo B12 (Figure 4(c)) and B12 (Figure 4(e)). Similar results were obtained with other naturally grown and cultured cell samples (data not shown). Table 2. 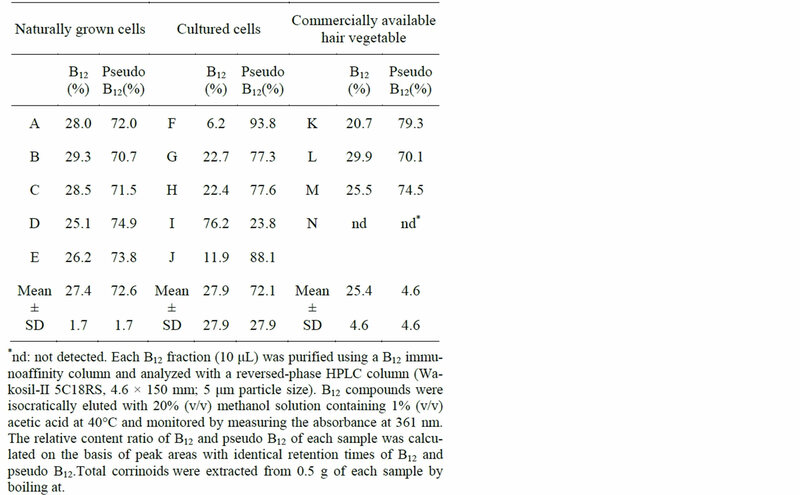 Relative content ratio of B12 and Pseudo B12 contents in various sources of Nostoc flagelliforme (naturally grown and cultured samples and commercially available hair vegetable samples). Figure 3. Liquid chromatography-electrospray ionization/multistage Mass spectrometry (LC/ESI-MS/MS) of authentic B12 and pseudo-B12. B12 and pseudo B12 were analyzed with LCMS-IT-TOF (Shimadzu) as described in the text. The total ion chromatograms (TIC) of authentic B12 and pseudo B12 are shown in panels (a) and (d), respectively. The mass spectra of each ion peak from B12 and pseudo B12 are shown in panels (b) and (e), respectively. The magnified mass spectra from m/z 678 to 680 in B12 and from m/z 672 to 675 in pseudo B12 are shown as inserts. The MS/MS spectra of the peaks of B12 and pseudo B12 are shown in panels (c) and (f), respectively. Figure 4. 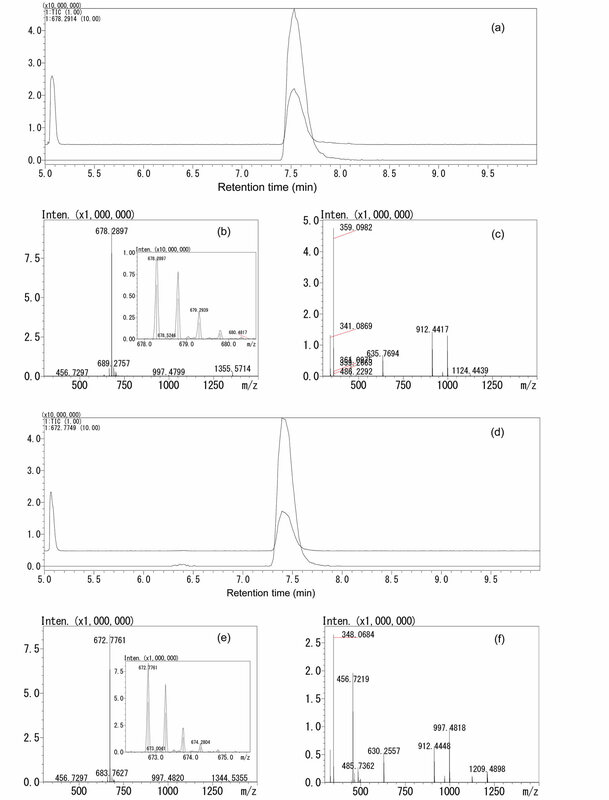 Liquid chromatography-electrospray ionization/multistage mass spectrometry (LC/ESI-MS/MS) of the purified corrinoids from naturally grown Nostoc sample (sample E). Total ion chromatograms (TIC) and reconstructed chromatograms for m/z 678.29 (×10) and 672.77 (×10) of the Nostoc corrinoids are shown in panel (a). 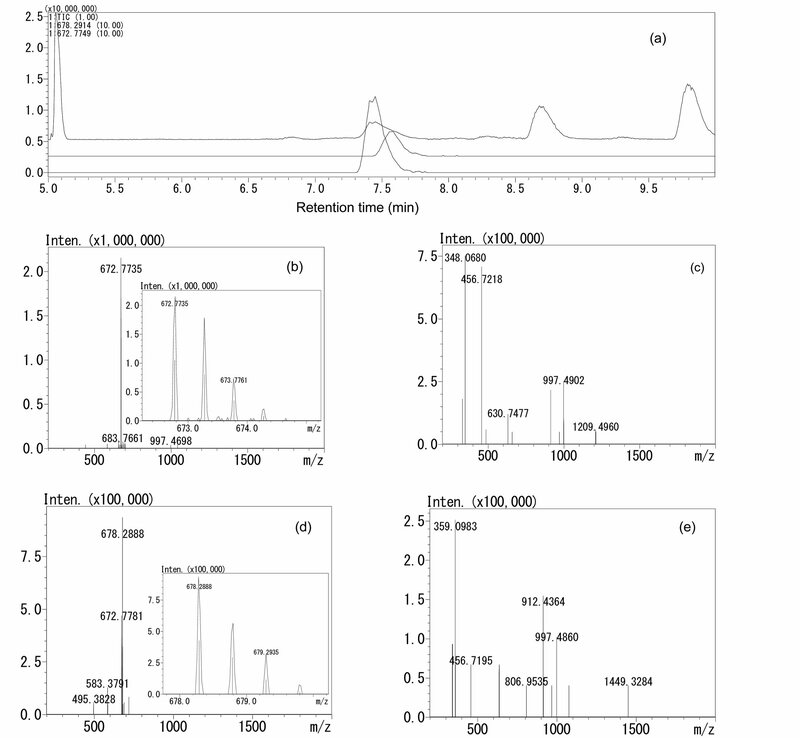 The mass spectra of the ion peaks of the Nostoc corrinoids at retention times of 7.2 min and 7.4 min are shown in panel (b) (the magnified mass spectrum from m/z 672 to 675 is shown as an insert) and panel (d) (the magnified mass spectra from m/z 678 to 680 are shown as an insert), respectively. The MS/MS spectra for the peaks of the Nostoc corrinoids at m/z 672.7735 and at m/z 678.2888 are shown in panels (c) and (e), respectively. may have been due to differences in the culture conditions, but we have no detailed information on the key factor that affected B12 and pseudo B12 ratios. These results indicate that most Nostoc samples and commercially hair vegetable samples contained pseudo B12 (major) and B12 (minor). Figure 5. Microscopic analysis of various Nostoc flagelliforme samples. (a) Naturally grown samples; (b) cultured samples, (c) commercially available hair vegetable samples K-M (C, cells; and F, fake item), and (d) commercially available hair vegetable sample N. The results represent typical microscopic data from various N. flagelliforme samples. pseudo B12, which is inactive in humans  and because the fake items have very low B12 contents, commercially available hair vegetable is not suitable for use of B12 source, regardless of the presence of the fake items. Cyanobacteria have the ability to synthesize pseudo B12 , which functions as a coenzyme of methionine synthase to catalyze the synthesis of methionine from homocysteine and N5-methyltetrahydrofolate . In the present study, the cultured Nostoc sample I predominantly contained B12 but not pseudo B12 (Table 2), suggesting that N. flagelliforme may synthesize both B12 and pseudo B12 de novo. Further biochemical and genetic studies are required to elucidate the detailed physiological functions of each corrinoid in this terrestrial cyanobacterium. Resources Council, Science and Technology Agency. “Standard Tables of Food Composition in Japan—Vitamin K, B6, and B12,” Resource Council, Science and Technology Agency, Tokyo, 1995, pp. 16-56. Y. Yabuta and F. Watanabe, “Corrinoid Compounds in Cyanobacteria,” In: P. M. Gault and H. J. Marler, Eds., Handbook on Cyanobacteria Biochemistry, Biotechnology and Application, Nova Science Publishers, Inc., New York, 2009, pp. 485-505.